the FX industry must use. 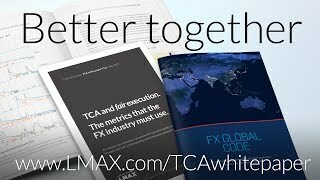 The LMAX Exchange TCA white paper proposes a blueprint for FX TCA metrics. Comprehensive FX TCA methodology developed to help market participants control execution quality and reduce trading costs. Request a hard copy of the white paper. Clients and LPs can equip themselves with an effective way to calculate cost of trading. Same ecosystem, same LP. Why do fill rates differ for market vs limit orders? At LMAX Exchange we view rejected orders as an opportunity cost. There’s a real ‘money value’ to a missed order. Price variation. Slippage v price improvement varies by LP. Why? Price improvement is standard on the LMAX Exchange ‘true market’ CLOB with slippage to improvement roughly 2:1. Price improvement though is virtually non-existent with ‘last look’ LPs, with their slippage ratio sometimes skewed as much as 9:1. Discretionary hold time? Without a 100% fill rate there’s a cost to hold time. There is NO hold time at LMAX Exchange – you are matched – or not, instantly. Yet from the TPA data we were able to pinpoint a cost to hold time of $25/M at 100ms with ‘last look’ LPs (unless you get a 100% fill rate). Plus – 60% of that cost also happens in the first 10ms! Market impact. Slow LP response = sharp yield decay per $M traded. If an LP is holding your order, which has already been acted on – it is going to cost you money: either through a lower fill rate or greater price slippage! Bid-offer spread. How do you accurately measure effective spread? Tight spread good – wide spread bad. If only it was that simple! We found that you must take into account other FX TCA metrics to judge effective spread. At 84 pages, the FX TCA and fair execution white paper is an extensive read. But through the educational video below, David Mercer, LMAX Exchange CEO, breaks it down and walks you through the comparative examples of firm and last look liquidity, highlighting the often unacknowledged execution advantages offered by firm liquidity venues. Discover how the benefits of firm liquidity deliver complete trading control. The underlying processes of the LMAX Exchange, anonymous, central limit order book (CLOB) hold opportunities and challenges for customers used to trading on ‘last look’ venues. However the benefits of firm liquidity as the transparent, cost-effective choice that places the trader in complete control of their execution quality, with no pre-trade information leakage is demonstrated clearly. Cohesive, complete information will forge the path to informed choice for the trader and go a long way to sweeping away the distrust built up over the past few scandal ridden years. LMAX Exchange Group is the holding company of LMAX Limited and LMAX Broker Limited | LMAX Exchange is a trading name of LMAX Limited, which operates a multilateral trading facility, authorised and regulated by the Financial Conduct Authority (firm reference number 509778) and is a company registered in England and Wales (number 6505809) | LMAX Global is a trading name of LMAX Broker Limited which is authorised and regulated by the Financial Conduct Authority (firm reference number 783200) and is a company registered in England and Wales (number 10819525) | Our registered address is Yellow Building, 1A Nicholas Road, London W11 4AN.